Remarks by H.E. 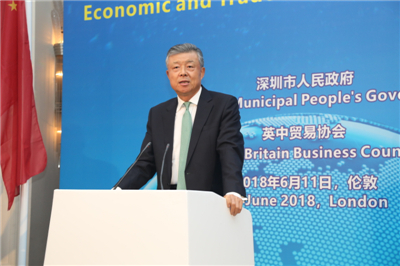 Ambassador Liu Xiaoming at the China(Shenzhen)-UK(London) Economic and Trade Cooperation Conference: Stay at the Forefront of Reform and Opening up, and Contribute to China-UK "Golden Era"
I am happy to join you at the China (Shenzhen) - UK (London) Economic and Trade Cooperation Conference. On behalf of the Chinese Embassy, I would like to extend our warm welcome to Secretary Wang Weizhong and his delegation. This year is the 40th anniversary of reform and opening up in China. It is a perfect year to hold this conference in London. Forty years ago, Shenzhen was a small border town near Hong Kong. Forty years on, Shenzhen is a star of China’s first tier cities. This is the legendary “Shenzhen story”. Shenzhen is first of all a microcosm of China’s rapid development. Its metamorphosis from a tiny fishing village to an international metropolis took only four decades. Its GDP has grown by over ten thousand folds, from 197 million yuan in 1979 to 2.24 trillion yuan in 2017. It has sustained an average annual growth rate of 23%. The Economist marveled at the “Miracle of Shenzhen”, calling it the biggest success story of more than 4,000 SEZs. Indeed, Shenzhen is the best example of China’s historic leap from “getting on its feet” to “becoming prosperous”. It is the best illustration that socialism with Chinese characteristics is the right path to success. Second, Shenzhen is the standard bearer of reform and opening up. For forty years, Shenzhen has been at the forefront of reform and opening up in China. With its down-to-earth and pioneering spirit, Shenzhen has created over one thousand “national first’s” in China’s market-oriented economic reform. In recent years, Shenzhen is leading a new round of reform and opening up. This centres on supply side restructuring and emphasises better property rights system and market-based allocation of factors of production. Reform and opening up has been the “secret” to Shenzhen’s leapfrogging development. Reform and opening up will continue to be the driving force behind China’s high quality growth in the new era. Third, Shenzhen is a promised land for innovation. Shenzhen is known as China’s capital of innovation. The city has innovation in its genes. Shenzhen invested more than 4% of its GDP in research and development, which was one of the highest in the world. Shenzhen filed over 20,000 international patent applications under PCT, leading all Chinese cities for the 14th consecutive year. Shenzhen was the 6th most competitive city in the world, with added-value of hi-tech industries accounting for 32.8% of GDP. Going forward, Shenzhen will make innovation the focus of sustainable megacity development, and, around this theme, build a national innovation demonstration zone on the sustainable development agenda. Innovation has been Shenzhen’s road to success. Innovation will also be a broad thoroughfare leading China from being prosperous to becoming stronger. As China-UK relations accelerate in the “Golden Era”, exchanges and cooperation between the two countries at the sub-national level continue to deepen. Shenzhen has forged close ties with the City of London, Scotland and the British Virgin Islands. 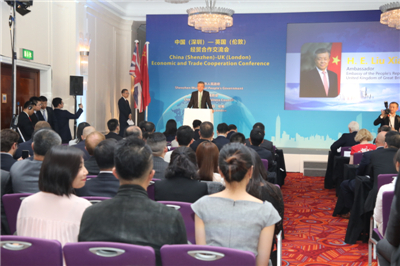 Companies from Shenzhen, such as Huawei, BYD and China Merchants Bank, are achieving great success here in the UK. Looking ahead, we see huge potential and broad prospects for the cooperation between Shenzhen and the UK in scientific and hi-tech innovation, financial services, creative industry and AI manufacturing. Shenzhen is not only a Chinese city. It also belongs to the world. I am confident that Shenzhen will continue to be at the forefront of China’s reform and opening up. It will also play a leading role in the mutually beneficial cooperation between our two countries, and continue to contribute its part to China-UK “Golden Era”. 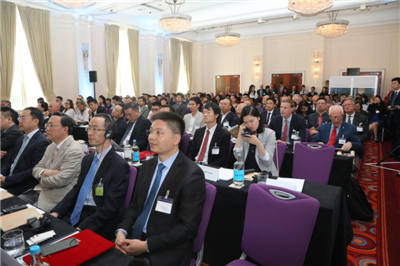 In conclusion, I wish China (Shenzhen) - UK (London) Economic and Trade Cooperation Conference great success!